Recently we’ve been to two break-ins where thieves have got in by forcing open the centre fastener on a sash and case window. Good window security can often be neglected this is surprising as its reported that 65% of domestic burglaries occur when a window has been forced usually at the rear of the property. If your exterior doors function well and look presentable, checking them isn’t likely to be at the top of your to-do list. But for improved security, take a few minutes to evaluate the doors in your home. Determine the doors composition. If it’s a hollow-core door, replace it. A hollow-core door is very easily broken through. If you can’t afford to replace it, add a deadbolt near the lockset. Doors made of solid wood usually provide adequate security – if they are in good condition. Consider thickness (under one and three-quarter inches is too thin and won’t stand up to a strong kick), age (check for signs of deterioration and make necessary repairs), and pattern (floating panels can allow the door to break if kicked; solid fascades with little or no decoration at best). Many newer wood doors are actually surfaced with wood panels or pressed-wood look-alike composites and have a reinforced solid core between. 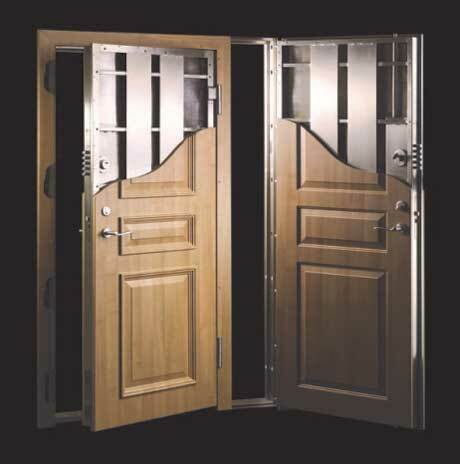 These offer both the security of a new, solid-core door and the beauty of wood. Metal-clad doors provide the most security. Steel – plain or pressed to look like wood panel – is attached to a solid wood frame and a fibre core. These doors are strong, weatherproof, and low-maintenance. Reinforce the frame. If the gap between door and frame is more than 1/16 of an inch or if the door gives when pushed or moves from side to side when pried, reinforce the frame. Gap and play allow room for a pry bar to be slipped in and the door worked open. Also, check for rot, especially around the lock. Rotting framework should be replaced even if the door and lock are sound. Check windows and sidelights. Any glass on the door or within arms reach of the lock or lockset (about 40 inches) should be made of shatterproof plastic or security glass. Within that distance, a burglar can easily break ordinary glass, reach in, and open the door in a few seconds. Most sliding glass, French, and glass panelled doors are double-paneled and made of suitable materials. With the notable exception of laminated glass, you can replace most glass panes yourself. If your door has decorative glass, install a protective panel of shatterproof plastic behind it, or sandwich it between two layers of safety glass. Even the best doors can be made more secure. Improving the security of your doors requires a few tools, simple hardware and a little time. Install peepholes on windowless exterior doors. Be sure you can see down to the welcome mat and out to both sides. The larger the barrel of the peephole, the more light. And that makes for a brighter, clearer view. Reinforce the door frame by inserting woodblocks, nailed in place, between the wall stud and the door frame. Gently remove interior moulding and install blocking at several points along the frame, especially where the hinges attach. Strengthen door and frame hardware by replacing any short screws on hinges with ones at least 2 inches long for the door side and at least 3 inches long for the frame side. Be sure screws that go into the frame sit firmly into studs. Replace the strike plate with a high-security model, like the one shown here, installed with three-inch wood screws that go deep into the frame. The steel rods, welded to the back of the strike plate, penetrate the stud and help prevent the door from being kicked in. Hi-quality locks and solid doors are the front lines of home security. 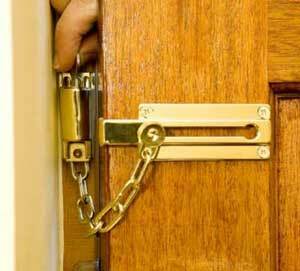 Burglars like to get into the house the same way you do – by walking through the door. That’s the easiest way for them to get items out, too. Hi-quality doors and locks make unwanted entry difficult and time-consuming – two things no burglar likes. Just the sight of a solid door and a high-quality lock can be enough to walk away. Look beyond the main front and back doors and secure all your exterior entryways. Service doors from the garage to garden, French doors to a second-story bedroom, old cellar and call chute doors, and doors to 3-season porches or conservatories should all be made as secure as possible. Certain interior doors deserve as much protection because they function as exterior doors. The door from an attached garage to the house and the door from the basement to the first floor are interior doors that a burglar can use to get into the main living area of the house. Be sure all components of your home’s entryways – frame, nearby windows, and surrounding walls – are secure; one weak spot is all the thief needs to gain entry. Door and lock manufacturers have learned that many homeowners want a front entryway that is both inviting to family and guests and a deterrent to burglars. That means you have plenty of styles and options to choose from. Amazingly, burglars often gain entry to a home simply by walking through unlocked doors or crawling through open windows. So get in the habit of keeping doors and windows closed and locked. Take a close look about your property: Does it encourage or discourage a would-be intruder? Most of the top ways to enhance the security of your building are remarkably simple. Clever property maintenance, effective lighting, and a number of effective locks go a big way in decreasing your properties attraction to intruders. When assessing your properties security, begin by evaluating two P’s: Perimeter And Point of Entry. That’s the way a intruder would consider your building. Perimeter applies to the grounds and outside night lighting. Trees and bushes placed near to the property and left unattended provide ready cover to a burglar. A garden without walls makes getting in and out quicker. A ladder or equipment left on the garden can be used to get in. Points of entry are, of course, all your doors and windows – even windows above the first floor. If you leave any windows or doors open most of the time or if they are in obvious poor repair, a burglar can get in or out quickly. Start by evaluating exterior doors – nearly 90% of all illegal entries are right through your door. For some more specific advice on evaluating the security of your home, follow our list of security tips I will give you an idea of what you need to do to improve your home security. And, you’ll want to consider how you live in your home. For example, if you have good locks but often don’t bother to use them, getting better locks won’t increase your security. Getting in the practice of locking the door will help. Your family’s lifestyle is especially important when evaluating new locks and installing an electronic alarm system. These systems have become fairly popular, and the options available are staggering. If you have a good idea of how your family will use the security system you’re much more likely to get what you need – not too much, not too little. And these systems work best in homes that have covered the security basics. The goal is to feel safe and comfortable in and around your home. Keep that in mind as you evaluate your home and prioritise the list of security home improvement projects. You want to improve your home’s security, but you’re not sure where to start. Evaluating it, inside and out with this questionaire will give you a good overall security picture, and the weakest spots will likely jump out at you. Be objective. You create a false sense of security when you downplay your home’s current shortcomings – a door that wiggles in it’s frame, even if it’s just a touch, is not secure. Conversely, there is no need to panic about short comings – adding a deadbolt is most likely sufficient to secure a solid door that’s in a reinforced frame; rebuilding the door is going a tad overboard. Have there been four or more burglaries in your neighbourhood in the last few years? Do you live a few blocks from a major highway or adjacent to a wooded area? Is your home unoccupied at regular times each day? Do you have unusually valuable jewellery, artwork, collections, or electronic equipment in your home? Do you live on a cul-de-sac? Does your neighbourhood lack a program for keeping an eye out for criminal activity? An answer of yes to any of the above means you could have an above average risk of a break-in – and now is the time to evaluate and improve the security of your home and neighbourhood. Do you keep a spare house key under a mat, in a flowerpot, or elsewhere outside? Do you have hollow-core doors leading into your house from the outside? 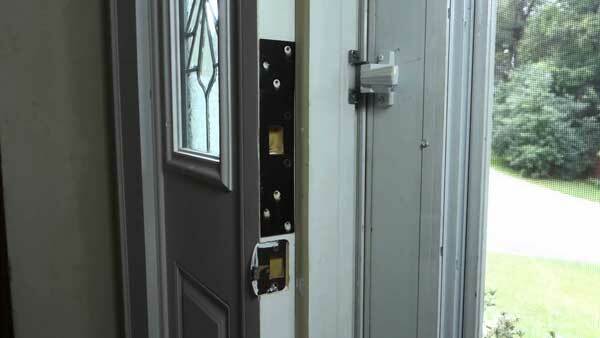 Are any of your exterior doors not secured by a heavy-duty dead-bolt lock and reinforced strikeplate? Can your expensive stereo or computer system be easily seen by looking in the window? Is your pet door large enough to allow a person to squeeze through? All of these make your house a more attractive target to burglars. All of them are relatively easy to fix. Now is the time to focus on these shortcomings and correct them. Could a tree branch give an agile climber access to a second-story window or balcony? Do overgrown trees or shrubs prevent any of your doors or windows from being seen from the street or from a neighbour’s house? Are all sides of your house well-lighted at night or equipped with motion-sensitive lights? Is your lawn well-maintained, or does it look like your home may be unoccupied? Do you leave valuable lawn and garden equipment in your garden? Home security is more than locks and solid doors. If a burglar can get close to your house without being detected, he has more time to get inside without being noticed. Your garden says a lot to a burger casing homes in your neighbourhood. Make sure your home tells the intruder to get lost! Do you use timers on some lights? Do you leave any doors or windows unlocked? Is your mail or newspaper picked up every day by a friend or neighbour? When you’re on holiday, your house should look as though you’re still home. Sliding patio doors are supplied with integral locks, and several different locking systems are used, ranging from a simple hook and bar to elaborate multi-point locking bolts. Old doors generally have a very low level of security, with the locks easy to force and the doors capable of being lifted off the tracks from inside. More modern doors are generally better, but unless they incorporate key-operated multi-point locking and anti-lift devices, you should add surface mounted key operated patio door bolts to the door frame at the top and bottom. These are now a requirement of many household insurance companies. Take care when sitting the bolt bodies so that the holes you have to drill in the doors will clear the edges of the double glazed panes. Do not attempt to fit these bolts to the UPVC patio doors, which should incorporate adequate built-in security features. Contact the door manufacturer for advice if you want to upgrade them further. 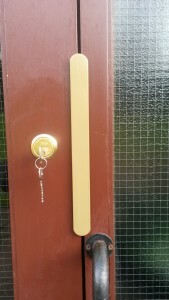 An alternative way of locking patio doors is with a locking bar. This fits between the frame against which the sliding door closes and the end of the fixed pain, locking the two together to prevent both forcing and lifting. It locks automatically on closing and is key operated. 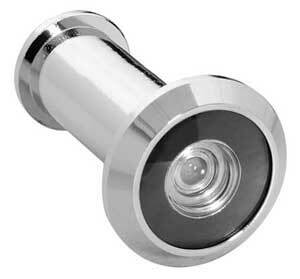 You can provide additional security for your doors by fitting bolts of various types. The simplest is the surface mounted barrel bolt, which you can use to secure hinged back doors (including outward opening French doors). However, these are only as secure as their screw fixings and can be opened from outside if the can be reached through a broking pane in or beside the door, or through a letterbox or cat flap. Lockable key-operated types are better than ordinary bolts in this respect. Mortise rack bolts are better for backdoors. 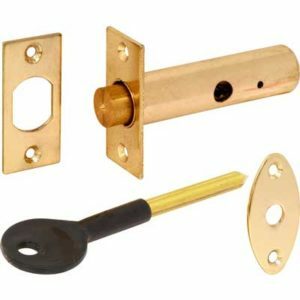 They have a cylindrical casing which fits in a hole drilled in the side or top edge of the door and shoots a bolt into a hole drilled in the door frame at the turn of a key. For maximum security fit two to each door, one at the top and one at the bottom. 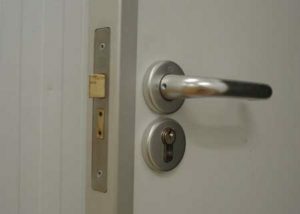 The lock is operated from within the house only by a standard splined key, so a burglar can, in theory, operate it if he carried a matching key and was prepared to break a window or door frame to reach the lock. Keep your own rack bolt keys away from the door, stored somewhere handy in case you need to use the door as a fire escape. Hinge bolts or dog bolts are affixed steel pegs that are set into the hinge edge of the door and engage in holes drilled in the door frame when the door is closed. They prevent the hinged side of the door from being forced and are a must for outward opening French doors where the hinge pins are exposed and can be removed from inside. They are fitted in pairs, one just below the top hinge and the other just above the bottom hinge. replace large panes of ordinary glass in doors and adjacent side panels with wired or laminated glass or all carbonates sheeting. consider having metal security grills fitted to glass doors in vulnerable positions. repair or replace rotting door frames. 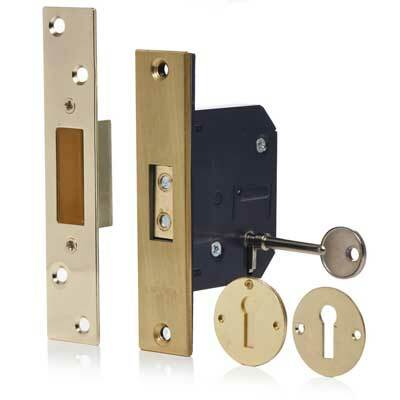 You can buy metal plates which you fit the inner and outer faces of the door that has been weakened by the installation of a mortise lock. The plates are fitted using security bolts so they cannot be removed from the outside. You can also fit frame reinforcing strips to the door frame to strengthen the locking points. 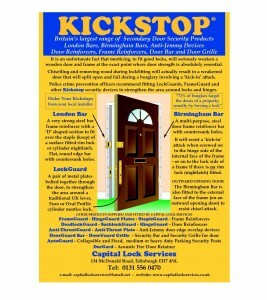 Both plates and strips are available from Capital Lock Services. If the door frame moves when the door is slammed, its fixings need reinforcing. Secure each side of the frame to the walls by drilling through the width with a twist drill, then on into the brickwork with a masonry drill. Insert a special long-sleeved plastic frame plug into the wall until its collar is flush with the frame and tighten the integral screw. A door viewer is a two-part spy hole which fits in a hole drilled in a solid door. One half of the viewer consists of a wide angle lens housed in a slim tube which is inserted into the hole from outside. The other half is inserted from the inside and then screwed into the lens section to lock the two parts together. You can tighten a knurled (ridged) type by hand, and a slotted type with a large screwdriver or the edge of a small coin. The inner part of the viewer may be fitted with a pivoting cover, which when closed will prevent any indoor light being visible from outside through the viewer. When installing a door viewer, fit it at the height where it can be used easily by all members of the family, and teach your children the importance of identifying callers before opening the door. 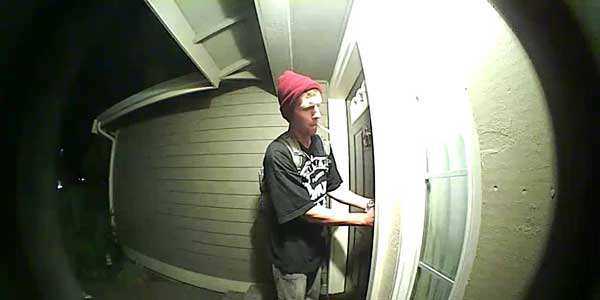 Remember that you will not be able to use a door viewer at night unless your porch is well lit. 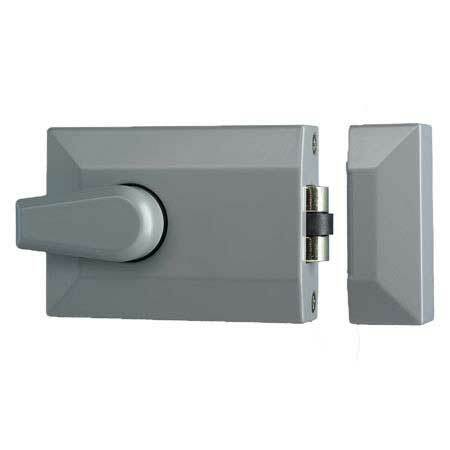 A door chain or door limiter is a device that allows you to open the door a short way in order to vet all callers while preventing someone from pushing his or her way past you and is essential if you have glazed doors where a door viewer would be pointless. Two types of door limiter are available. The first holds the door ajar with a short length of strong chain, the second with a short rigid bar. In both cases, the keeper is screwed to the inner face of the door, and the fitting with the chain or bar is secured to the door frame. The door has to be closed to allow the chain or bar to be released from the keeper, providing an extra degree of security since the caller cannot release it from the outside. 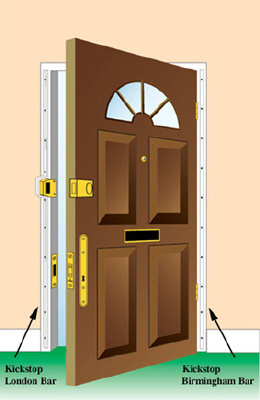 Whichever type is selected, its strength depends on the strength of the fixings, so it is vital to use the longest possible screws to attach the components to the door and its frame. 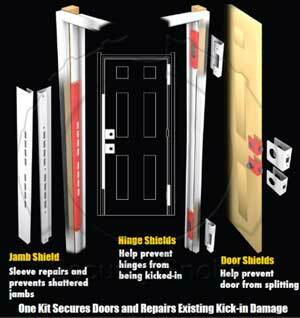 Those supplied with many door limiters are simply not long enough to withstand an attempted forced entry.